Disclosure: All travel and accommodations provided by United Artists Releasing. All thoughts, opinions and experiences are 100% my own! 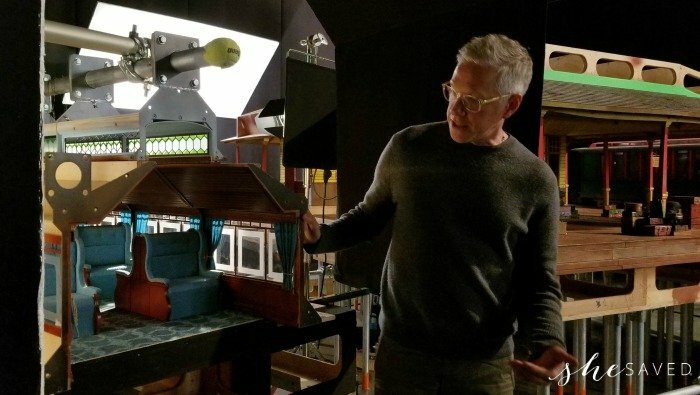 Coming to theaters April 12th is MISSING LINK and I’m so excited to share with you that I recently had the opportunity to visit LAIKA Studios where this movie was created! We were able to walk through the different phases of production including everything from costume design to screening about 20 minutes of the movie and I have to say, I can’t wait for this one to hit the big screen! I had no idea the amount of work that goes into creating these stop motion animation films! First of all, and most fascinating to me is that these characters are all created in puppet form. As you can see above and below, just like an actor in a movie, each puppet has it’s own wardrobe and according to Missing Link Costume Designer Deborah Cook it can take up to a year to get the final version of a costume for puppet characters. With a team of 25 working hard to ensure that all of the details come together, an insane amount of work and time go into each look that each character has in the finished product. Even more fascinating to me was that the puppets themselves are created in-house using 3D printing technology. I had never seen anything like it, but it was fascinating to watch. As you can see in the photos below, the faces of these puppets and their different expressions are literally being printed in the 3D printer and as they go through the filming process, they will swap out the different faces (after they have been painting and retouched, of course) to create the different looks and expressions that we see in the film. I was also really surprised to learn that a lot of this film is shot on miniature sets. As you can see from the photos above, the puppets are quite small, just a bit larger than a Barbie doll. 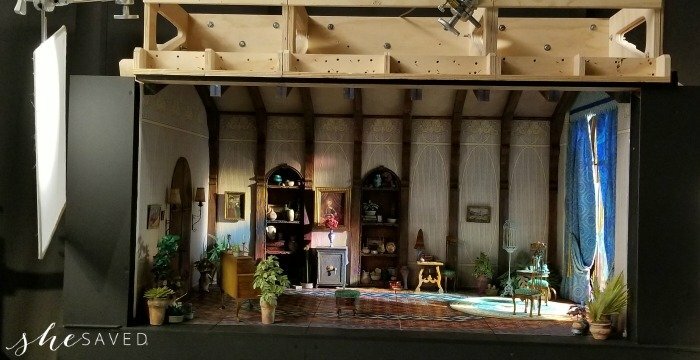 So throughout Laika Studios there are sets from different scenes and they literally look like little dollhouse rooms. The detail on these sets is mind blowing. Another thing that blew my mind was that this entire film was shot with a Canon 5D camera. How crazy is that? While not all sets are done in miniatures (as you can see from the photo below of the ship) it’s amazing to me how this all comes out to look so realistic on the big screen. We actually got to screen the scene from the ship and it was so believable that it actually made me sea sick. Steve Emerson, the visual effects supervisor at Laika shared that these are really hard films to make. Steve also shared with us that the whole point of stop-motion animation is to make it look effortless. And that’s the crazy part to me. After being on the sets and seeing all of the incredible detail, I can’t believe the amount of work that goes into these movies and I have so much admiration and respect for the people behind the scenes on these films. As I mentioned, some sets are very small, while other scenes were filmed on larger sets. For forest scenes, the set below was used and then everything gets scaled together in the final editing of the film. Here’s a peek at one of those larger sets and of course again, you can see the Canon 5D camera set up to film the shots! My job is pretty much to work with the director and the head of studio to make sure that the films are beautiful, interesting to look at, and potentially commercially successful. This is something I’ve done for a long time. I was started in theater and film and television and stuff like that,and I found my way to stop frame. And what I love about it is you get to control everything. So, I love the sort of plastic quality of the design process in that I’m not location scouting and having to adapt things. I’m building the dirt and the buildings and the everything, and it’s–even though that can be quite daunting, it’s just a really fun process to be involved with. So, that’s how I landed here. As I mentioned, I can’t wait to see the rest of this movie! Written and directed by Chris Butler, Mr. Link has so much personality and from what I’ve seen so far, the storyline to this film is exciting and of course, they knocked it out of the park with the voice characters for this one with a cast that includes: Hugh Jackman, Zoe Saldana, Zach Galifianakis, Timothy Olyphant, David Walliams, Emma Thompson, Matt Lucas, Ching Valdes-Aran, Stephen Fry, Amrita Acharia. I’m so thrilled to have been able to spend time at Laika and meet so many of the wonderful folks that put their heart and soul into this movie! 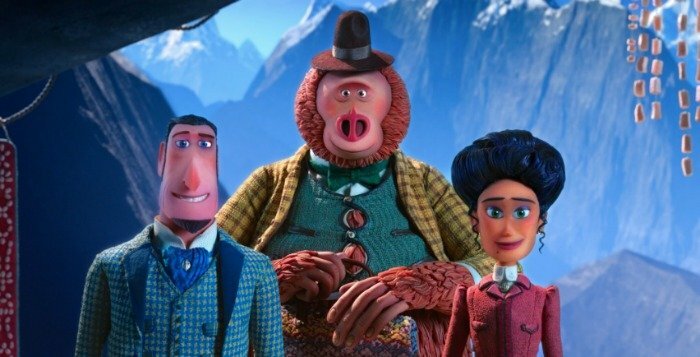 Missing Link hits theaters April 12th!! « We are BANANAS for Bananas Collectible Toys!! + Giveaway!